"He who truly knows has no occasion to shout". It’s a quote attributed to Leonardo da Vinci. It sprang to mind this week after I had been chatting to a Project Leader friend. He had been struggling with an IT Project but had managed to get it back on the rails thanks to a very simple trick. He listened. To be clear, he is an excellent Project leader who solicits the views of everyone on his team and has regular meetings. He says, "You don't get all the great ideas just because you're in charge. 80% of the really good stuff comes from the team, the ones with their sleeves rolled up working in the engine room." BUT this one had them all stumped. They had meeting after meeting, they brainstormed face to face and electronically and they tried role storming where you come at the problem from someone else's perspective. The meetings were noisy and passionate, there was no lack of enthusiasm for solving the challenges but nothing they came up with worked. He told me, "I have a team of seasoned IT professionals, they all know their stuff but we were struggling. Then, one sunny Autumn afternoon, I was standing next to one of my quieter members of the team at the hot water urn making a cup of tea. Almost rhetorically, I asked, 'What are we gonna do?'" He told me the next ten minutes were like opening a flood gate. "Ideas just flowed out of him. Ideas that clearly were not just thought up on the spot. He'd given measured thought to our issues and had solutions that none of us had thought of. So I called a meeting, gave him the floor and at first, he blushed the colour of a beetroot and then he explained his thinking. We acted on all his suggestions and without a doubt, he saved the project." Firstly, when the going gets tough, make a brew. Secondly, always put yourself in a position where you can listen to all your talent, not just the ‘alpha-types’ and brash ones! My friend told me, "Later, reflecting upon this I wondered why he had not spoken up sooner. I mean, we have plenty of meetings and the door is always open - well it's an open plan office! I was quite angry that these measures could have been implemented at a much earlier stage. Why hadn't he shared his thoughts." Why indeed. Surely it is the responsibility of everyone involved to contribute their ideas, otherwise, what are they being paid for? The trouble is, as my friend discovered, those who shout loudest get heard. It doesn't mean that they're right every time. The more that happens, the more your calm measured deep thinkers may dissolve into the background. "I thought back to meetings and played back events in my mind. Lots of shouting and excitement and enthusiasm and this one guy sat quietly. I realised he’d been trying to get a word in. And when he did manage to crowbar his way in someone would talk over him so he wilted till eventually, he stopped trying." It's a lesson to us all. Be aware of the interactions around you. If you notice that someone is quiet in meetings make time to speak with them personally to hear their ideas. Furthermore, encourage them to speak up in meetings - be an advocate for them. If you see someone being talked over, ask them what they think. You spend an average of 70% of your time communicating in one way or another. Despite a greater chunk of that communication being online these days you still only spend 16% of this time reading and 9% writing. Furthermore, just 30% of your communication time is spent speaking, which leaves an average of 45% spent listening. (*). When you consider that 'good communication skills' is on every list of 'must have attributes' of a great Project Leader, it is worth reflecting on that statistic. How much of this key skill do you dedicate to listening? Are you anywhere near the 45% mark? Think about where and to whom you are listening. 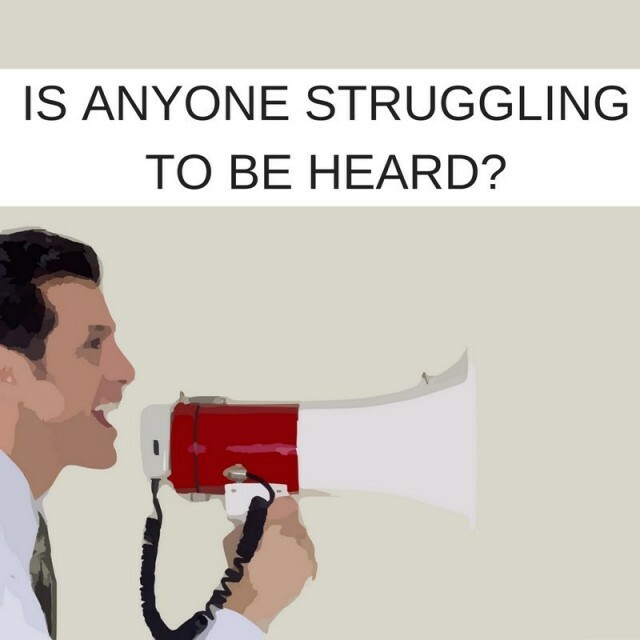 Are the same noisy voices setting the course for your project? Is anyone not getting heard? Sometimes, it is hard to see this for yourself. An independent third party Project Management partner can be a useful ally if your projects are struggling as they are removed from office politics and, if you choose the right partner, they will interview all team members to get all perspectives and not just the noisy ones. I think that Leonardo got it wrong when he said, "He who truly knows has no occasion to shout" in IT Project Management circles anyway, "He who truly knows has a responsibility to shout". More than that, though, the rest of us, especially those in charge, have a responsibility to listen. Contact us to learn more about how Stoneseed's Project Management as a Service can give you access to project management staff, resources and tools at a flexible and predictable cost via a fully structured managed service. (*) Listening Statistics based on the research of Adler, R., Rosenfeld, L. and Proctor, R. (2001) 'Interplay: the process of interpersonal communicating'. What does good look like in IT Project Management?